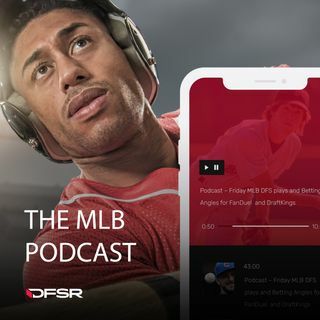 DFSR’s Doug Norrie and James Davis take to the podcast breaking down two slates of Wednesday MLB action. They start with the early slate talking some of the bigger arms like Trevor Bauer and Tyler Glasnow. There’s also a game in Coors to deal with considering the Rockies are throwing Jeff Hoffman and the Braves have a high run line once again. Then on the evening slate they look at Noah Syndergaard coming off a rough outing and whether Nick Pivetta can ever have his ERA catch his xFIP. And of ... See More course they have to talk about FanDuel putting Chris Davis at $500. All of this and more on a full MLB podcast for FanDuel and DraftKings.